o To enroll, simply contact our Director, Cynthia De La Torre, she will then gather some information from you and let you know what tutors we have available. o Yes, for the most part we are able to accommodate our clients’ desired schedules. o The majority of our tutors are college students. Many of our tutors are students that are majoring in math, science, or a related field, since that is what many of our students tend to struggle with. We have some tutors that are working on earning their teaching credentials, some that are working as substitute teachers, and some that already have their teaching credentials. Most, if not all, of our tutors have prior tutoring and/or teaching experience. Can we pick our tutor? o Depending on the tutor’s availability, areas of expertize, and desired driving distance, clients do have the option of selecting the tutor that their child will be working with. o Here is a list of some of our most recent tutors. We are constantly adding new tutors, which means the list is subject to change. What cities are you available to tutor in? o We provide tutoring in Chino Hills, Chino, Ontario, Eastvale, Corona, Mira Loma, Norco, Diamond Bar, Rancho Cucamonga, Alta Loma, Riverside, San Bernardino, Beaumont, Lake Forest, Ladera Ranch, Whittier, Pasadena, Pomona, Phillips Ranch, Upland, Claremont, Monrovia, Orange County, San Bernardino County, Riverside County, Los Angeles County, the Inland Valley, the Inland Empire, the Chino Valley, and the surrounding areas. To inquire about your city, feel free to contact us today. What subjects and grade levels do you tutor? o We provide tutoring in all subjects from all levels of Math to Science, English, History, World Languages, Writing, and more. We also provide tutoring for students of all ages from Pre-K to the College Level. We also work with adults that want to learn a new subject. o Once we have gathered all the necessary information from our clients, we will then contact our tutors to see who is available. We will then select the tutor we feel will be the best fit for our client and send them on an initial one-hour tutoring session with the client. After that first hour of tutoring, we will then contact our client to make sure they were happy with our tutor. If all goes well, we can proceed. If the clients are unhappy with the tutor, we will NOT charge them for that first hour of tutoring and we will then assign them a new tutor. How many sessions/hours a week do you recommend? o We recommend that students receive at least two hours of tutoring a week in order to gain the most out of tutoring. o Yes, we do have a contract that we require all of our clients to fill out. The contract outlines what our clients should expect from The Tutoring Solution and from our tutors as well as what we expect from our clients. Do we have to commit to a certain amount of sessions? o No, there are absolutely no time commitments. The client can cancel at any point. Is there a minimum amount of time required per lesson? o We require that lessons be at least 1 hour long. Is there a minimum amount of sessions per week? o No, there is no minimum amount of sessions per week; however, we do strongly urge that clients receive at least 1 hour of tutoring a week. 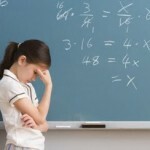 Should parents/guardians be present during the tutoring sessions? o Yes, if the student is under 18 years of age, we require that a parent or guardian be present. Why should we sign up for tutoring? o There are many reasons why one-on-one tutoring helps. Click on the link to read some of the reasons why you should sign up for tutoring. Do you have a tutoring center? o No, we do not. Our tutors go to the clients’ homes and tutor the students there. Clients also have the option of meeting with the tutors at a public location like a library or a coffee shop. How is this different than a tutoring center? o We find that in-home tutoring is more convenient for many parents and students because they do not have to drive anywhere for tutoring; instead, they can have tutoring from the comfort of their home. Parents can also observe the tutoring sessions and see first hand how their students are progressing. Additionally, when tutoring takes place at home, it encourages the family to set aside a time for learning, which makes it easier for students to regularly set aside that time to learn and complete assignments even when the tutor is not present. How does your tutoring program work? 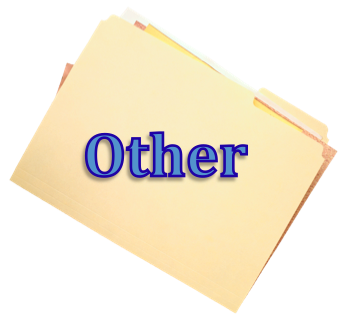 o Our tutors help students with homework assignments, projects, essays, research papers, tests, quizzes, etc. However, it must be noted that our tutors are not paid to complete the assignments for the students; they are simply there to guide the students and to help them gain a better understanding of the material being taught. o If the clients prefer, tutors can also create independent lesson plans so that the student will stay ahead of the class or to teach the student a subject that she/he is not learning in school. Do you administer any types of tests or assessments? o No, we do not have any specific tests that we administer. To assess where the student is at academically, we have our tutors go in and work with the student in order to gain a better understanding of how much the student knows – we find that the one-on-one tutoring sessions really reveal a lot about the student’s level of understanding. Additionally, when possible, we also have our tutors communicate with the teachers, since they have a greater understanding of what the student is struggling with and where they need to be in order to succeed. We find that students are the most successful when they have a strong educational support group and when tutors are able to discuss ideas with the parents and teachers. o We send bills via email through Quickbooks Intuit Payment. These bills will have a link that takes you to a secure site where you can pay online. We will send you a bill after the initial session. After that, we will send bills on the 1st and 16th of every month that you receive tutoring from us. o We accept Visa, Master Card, personal checks, and clients can also pay directly through their bank accounts. If you would like to discuss other payment options, feel free to contact us. 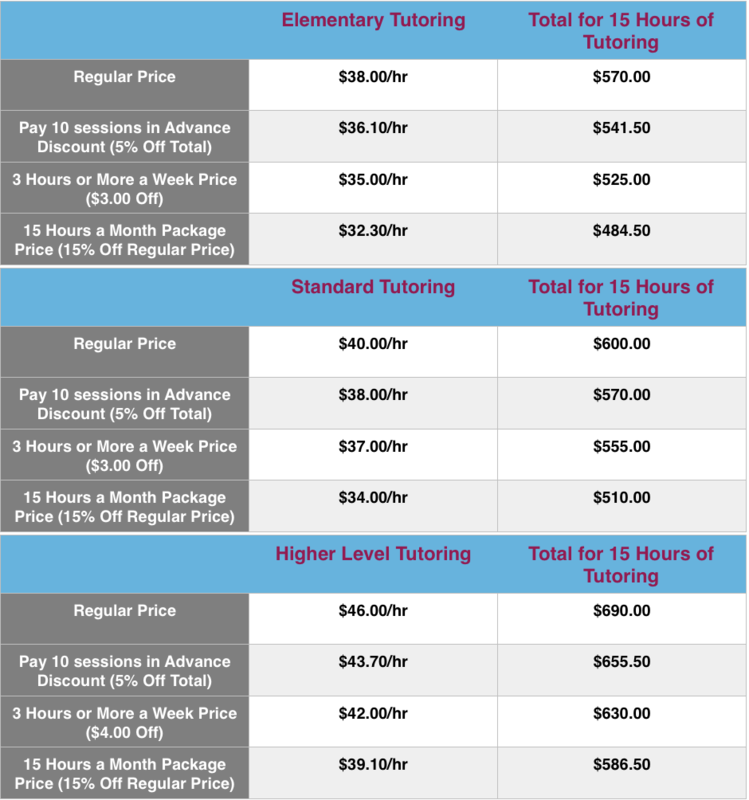 o We have different pricing for different types of tutoring. Are there any special rates offered? 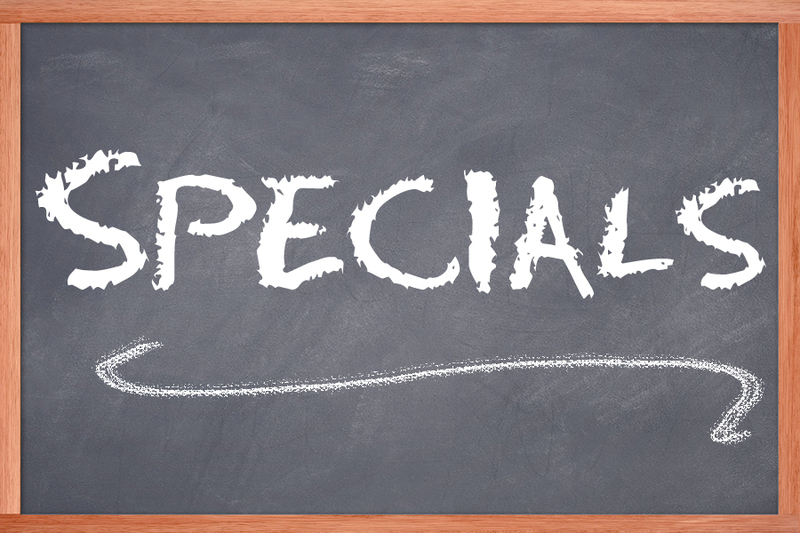 o Yes, we have regular specials available for people who pay in advance or for people who receive a certain amount of tutoring. Some of our regular specials are listed below. 5% off for clients that pay for 10 hours or more in advance. 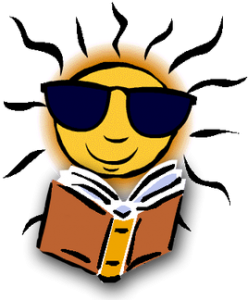 $5.00 off, per hour, from our regular tutoring rates during the summer months (from June 15 to August 31). Are there any free hours of tutoring offered? o Yes, please refer to our questionnaire to find out when we offer free hours of tutoring. o If payment is past due by 28 days (from the due date), every 28 days we will add an interest rate of 5%. Do you work with home-schooled students? o Yes, we do. We are able to work with families whose children are homeschooled and help provide additional support as needed. Our goal is to lend academic support to these families and to help them achieve their academic goals. Do you tutor foreign exchange students? 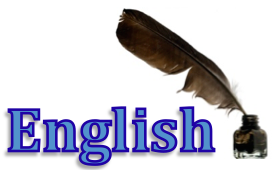 o Yes, we are typically able to find tutors that can communicate with the students in their native language as well as in English and help them with the classes they are struggling with. Do you tutor college students? o Yes, we have worked with many college students in the past. We have several highly qualified tutors that can help college students achieve their academic goals. Do you tutor special needs students? o Yes, we do. We have tutors that specifically work with special needs students. We will work with students and parents to ensure that we are offering the best possible support and utilizing teaching techniques that will best accommodate the students’ needs. Do you offer SAT, PSAT, ACT or GRE tutoring? o No, unfortunately at this time we do not offer this type of tutoring. Can you tutor more than one student at a time? o Yes, we are able to tutor more than one student at once; however, the students should be in the same grade level and being tutored in the same subject. We need to ensure that students gain the most out of the tutoring sessions. There is special pricing for two or more students being tutored at once. To find out more information, contact us today. How do can I get regular updates from you? o You can follow us on Facebook, Google Plus, Twitter and/or sign up for our newsletter. o Sí, la directora, Cynthia De La Torre, habla español. Estamos aquí para ayudarlos. Will you be offering scholarships in the near future? o Yes, we will. We will have more information on scholarships as the end of the school year approaches. To get regular updates, follow us on Facebook, Google Plus, Twitter and/or sign up for our newsletter. In the meantime, you can check out some of our past Share Your Passion Scholarship winners.